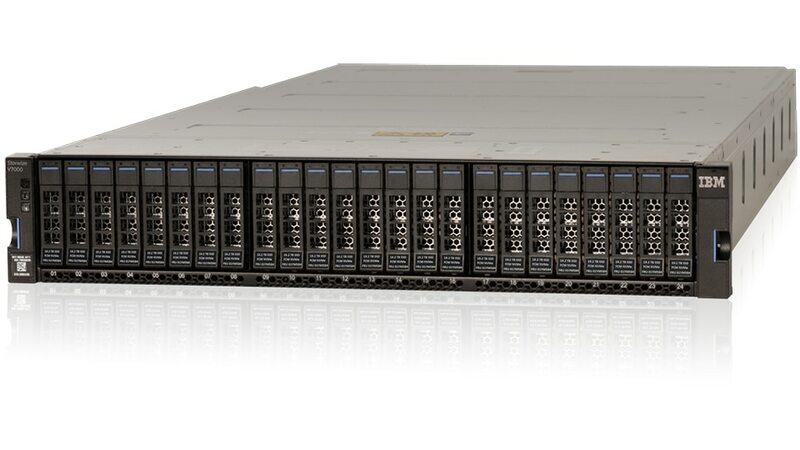 IBM® Storwize® V7000 is a solution that offers the advantages of NVMe, IBM FlashCore and IBM Spectrum Virtualize technologies. It can help you optimize performance with end-to-end NVMe flash storage while lowering capital and operational storage costs with awide range of market-leading data services. IBM Storwize V7000 enables you to take advantage of multicloud technology without replacing your current storage. Maximize efficiency and save money with innovative features like data reduction pools that include both deduplication and compression. Hybrid cloud support enables the use of cloud storage for data copies from more than 440 supported storage systems – speeding hybrid configurations deployment while slashing the potential cost. Extend data services to heterogeneous storage systems with features like compression, deduplication, automated tiering, thin provisioning, data copy services, security and high availability. Gain the highest levels of availability to support your mission-critical applications. Clustered systems can scale both up and out for performance and capacity. High density enclosures increase the maximum number of drives by almost three times. Unlock the value of your data and accelerate business execution with end-to-end NVMe-powered IBM FlashCore technology.